Many take place in the ninth lunar month (now october). Aki Matsuri, Autumn Festivals 秋祭り　to thank the gods for a good harvest and pray for the wellbeing of each family in the community. They are celebrated all over Japan after the rice harvest. Preparations take weeks and are a means to get the young men and women of the village together to practise the dances and tunes. Today, on the second weekend of October, is the Autumn Festival at our local shrine, I just come back from the simple but really endearing festivities. 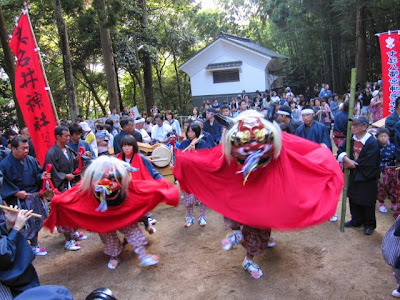 The local gods are transferred to small portable shrines (mikoshi), put in front of the shrine and groups of 3 men perform a lions dance in front of them. The kindergarden children this year also wearing colorful costumes and danced with their paper lion mask. Then all take the protable shrines about 500 meters to a clearance in the forest, where more ricewine for the elders and more dance for the gods is performed. With loud shouting they walk back to the shrine, another final dance and that was it. And on the following links, you find some very similar festival, since after all, most mountain communities in Okayama are the same. Here are some lovely pictures of such a small village autumn festival. Here is some kind of Lion Dance in Takebe, the village next to mine. 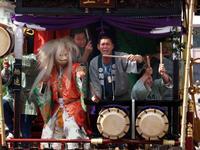 Here is a great link with haiku and pictures about many Autumn festivals in Japan. Copyright (C) 2000-2004 Yoshio Wada. At the shrine Suwa Jinja. 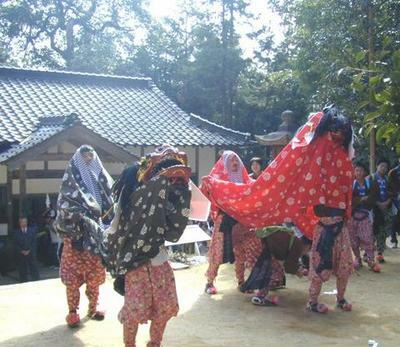 Wild dances, the mikoshi are carried from the shrine to a stop spot 御旅所 for more dances. Just for the fun of it, children harvesting rice by hand. The same sceene is also here in my village. This is a site with many Japanese topics, made by children, but in English, so you might enjoy to see more. the children's portable shrine ! There are more Japanese haiku on this link. This hokku is from late in the eighth month (September) in 1817, when Issa was living in his hometown. During this month Issa apparently went to a festival, probably at a Shinto shrine, that consisted mainly of dances and prayers for a large rice crop, since at this time of year the rice harvest is just beginning or about to begin. A red dragonfly (or a group of them) is visiting the festival, and to Issa it looks as if it were also a member of the group of festival performers -- priests, priestesses, musicians, dancers, and others -- many of whom are wearing red robes, or possibly a mixture of red and white robes. The comparison isn't necessarily stretched or hyperbolic, since the ancient name for Honshu, the main Japanese island, was Dragonfly Island (Akizushima, later, in Issa's time, Akitsushima). In Japanese shamanism, dragonflies were believed to be spirits that lived in and protected the wet rice fields and thus ensured good crops, and since there were many fertile rice fields in Yamato, the land was named after them. The fall festival in this hokku almost certainly has prayers for a good harvest as one of its main activities, so Issa may take the dragonfly to be appearing at the festival in order to make a contribution in its own unique way. The dragonfly, after all, is instinctively doing its part by helping to protect the maturing rice crop against various insects that would harm it, and its flight provides additional beauty and drama. White and red are the two main colors worn by participants and used for decoration at festivals and at many kinds of public and private celebrations even today in Japan. Many Shinto shrines likewise have large red gates (torii) and halls with much red in them. Red was believed to be a purifying color that was even stronger than white, so it was used at purifications as well as at celebrations, while white and black were used at funerals. Perhaps because it is the color of blood, red was said to represent life and energy, and it was believed to be powerful enough to drive away demons and protect against misfortune. Following a cosmology imported from ancient China, in Issa's time red also referred to the south and to the sun and warmth.